The dsp.TransferFunctionEstimator System object™ computes the transfer function of a system, using the Welch's averaged periodogram method. Create the dsp.TransferFunctionEstimator object and set its properties. tfe = dsp.TransferFunctionEstimator returns a transfer function estimator object, that computes the transfer function of real or complex signals. This System object uses the periodogram method and Welch’s averaged, modified periodogram method. tfe = dsp.TransferFunctionEstimator(Name,Value) returns a transfer function estimator object with each specified property set to the specified value. Unspecified properties have default values. Specify the source of the FFT length value as either 'Auto' or 'Property'. If you set this property to 'Auto', the transfer function estimator sets the FFT length to the input frame size. If you set this property to 'Property', then specify the number of FFT points using the FFTLength property. Specify the length of the FFT that the transfer function estimator uses to compute spectral estimates as a positive, integer scalar. Specify a window function for the transfer function estimator as one of 'Rectangular', 'Chebyshev', 'Flat Top', 'Hamming', 'Hann', or 'Kaiser'. This property applies when you set the Window property to 'Chebyshev' or 'Kaiser'. 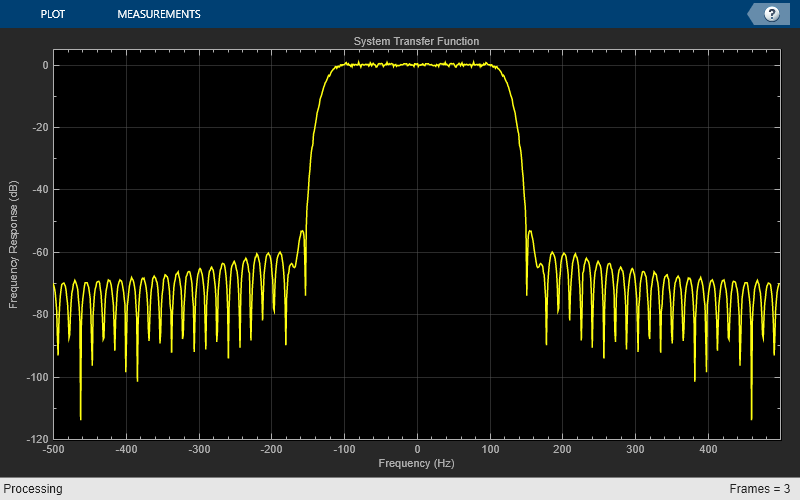 Specify the frequency range of the transfer function estimator as one of 'twosided', 'onesided', or 'centered'. If you set the FrequencyRange to 'onesided', the transfer function estimator computes the one-sided transfer function of real input signals, x and y. If the FFT length, NFFT, is even, the length of the transfer function estimate is NFFT/2+1 and is computed over the interval [0, SampleRate/2]. If NFFT is odd, the length of the transfer function estimate is equal to (NFFT+1)/2, and the interval is [0, SampleRate/2]. If FrequencyRange is set to 'twosided', the transfer function estimator computes the two-sided transfer function of complex or real input signals, x and y. The length of the transfer function estimate is equal to NFFT and is computed over [0, SampleRate]. If you set the FrequencyRange to 'centered', the transfer function estimator computes the centered two-sided transfer function of complex or real input signals, x and y. The length of the transfer function estimate is equal to NFFT and it is computed over [-SampleRate/2, SampleRate/2] for even lengths, and [-SampleRate/2, SampleRate/2] for odd lengths. Specify the number of spectral averages as a positive, integer scalar. The transfer function estimator computes the current estimate by averaging the last N estimates, where N is the number of spectral averages defined in the SpectralAverages property. Specify true to compute and output the magnitude squared coherence estimate using Welch’s averaged, modified periodogram method. The magnitude squared coherence estimate has values between 0 and 1 that indicate the correspondence at each frequency between two input signals. If you specify false, the magnitude squared coherence estimate is not computed. tfeEst = tfe(x,y) computes the transfer function estimate, tfeEst, of the system with input x and output y using Welch's averaged periodogram method. [tfeEst,cxy] = tfe(x,y) also computes the magnitude squared coherence estimate, cxy, of the system. First data input, specified as a vector or a matrix. x and y must have the same size and data type. Second data input, specified as a vector or a matrix. x and y must have the same size and data type. Transfer function estimate of the system for which x and y are the input and output signals, respectively. The estimate, tfeEst, is equal to pxy./pxx, where pxy is the cross-power spectral density of x and y, and pxx is the power spectral density of x. The transfer function estimate has the same size and data type as the input. Magnitude squared coherence estimate of the system, returned as a vector or a matrix. The coherence estimate, cxy, is equal to (abs(pxy).^2)./(pxx. *pyy), where pxy is the cross power spectral density of x and y, pxx is the power spectral density of x, and pyy is the power spectral density of y. For coherence to be estimated, the OutputCoherence property must be set to true. The coherence estimate has the same size and data type as the input. Generate a sine wave. Use the dsp.TransferFunctionEstimator System object™ to estimate the system transfer function and the dsp.ArrayPlot System object to display it. Create an FIR Filter System object of order 64 and (normalized) cutoff frequency of 1/4. Add random noise to the sine wave. Step through the System objects to obtain the data streams, and plot the log of the magnitude of the transfer function. Multiply the inputs by the window and scale the result by the window power. Take FFT of the signals, X and Y. For details on the moving average methods, see Averaging Method. The transfer function estimate is calculated by dividing Pyx by Pxx. Welch, P. D. ``The use of fast Fourier transforms for the estimation of power spectra: A method based on time averaging over short modified periodograms,'' IEEE Transactions on Audio and Electroacoustics, Vol. 15, pp. 70–73, 1967.